I’ve always looked up to my sister. She’s one of the strongest and most capable people I know. She was born without most of her right hand. I’ve not spent a tremendous amount of my life thinking about it, to be honest, since she’s the type of person who tends to be good at pretty much anything she tries, and with incredible grace and nonchalance. Growing up, we regularly attended Helping Hands events, a support group for families of kids with upper limb differences. I was always floored by how capable these kids were! Getting a Masters in Architecture and a series of other events brought me to KIDmob, the mobile kid-integrated design firm. We hold design workshops for kids, where they design and build out solutions to real challenges in their community. 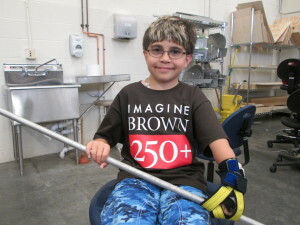 When I learned about Robohand, I was interested in connecting the dots: what if we brought a design workshop to kids with upper limb differences, to design and build their own prostheses? The Robohand is incredible for a number of reasons. Somehow, it still seemed lesser than in terms of its functionality: a less-functional version of a hand. Especially as kids embraced this cyborgian-looking device, it begged the question: why are we trying to replicate the complex functionality of a hand – when this cyborg body modification could do literally anything, including things that a typical hand is not capable of? We saw incredible opportunity in asking the question, if not a hand, then what? Superhero Cyborgs took place at Brown University’s School of Engineering, in partnership with The Helping Hands Foundation. Our facilitation team was made up of RISD designers, Brown engineers, a prosthetist, and talented makers. Participants were ages 7-17, and had a range of upper limb capabilities – we did not distinguish between prostheses and exoskeletons, as both augment the body’s natural capabilities. A variety of tools were available, from the analog – such as woodworking and casting – to the digital – such as 3D printers and lasercutters. One week is not a lot of time to design and fabricate a functional body modification. Recognizing this, we provided a system to solve two of the engineering challenges of prostheses: 1) a base to attach the device to the body, and 2) a mounting system to attach the “appendage” to the base. This left the third major challenge – the appendage and its functionality – to the participants’ creativity. So, what did this look like? We taught the kids plaster casting, as they each made a cast of the limb they wanted to design for. This would be available for them to test prototypes on. Our base system (attachment to the body) was Veraform Heavy and Altraform (two types of thermoplastic), Volara 4E 3/16” and ⅛” (two thicknesses of foam padding), and heavy duty velcro strips. Our mounting system (attach appendage to the base) was Chicago Screws 3/8″ and ¼” SS, that could be embedded into the thermoplastic such that the appendage could sit flush on the base. Beyond that, we had a slew of generic connectors, materials, and toy parts available to our young designers. Projects ranged from a tennis racket gripper, to a digitigrade stilt, to a telescoping arm with interchangeable parts for cleaning, and much more. One of our facilitators for this workshop, Erik Tompkins, is a prosthetist with POA Prosthetics – he helped participants figure out how to form their body mods to their body to ensure a comfortable and secure fit using the thermoplastics, padding, velcro, and other materials. Each participant proudly left with a usable prototype. One week was enough time for some of the participants to get to more refined stages of prototyping, having developed several iterations! One participant, Aidan, had his project further developed by Coby Unger, an artist in residence with Instructables/Autodesk. The concept is for a body mod that can 1) adapt in size with Aidan as he grows, 2) accept interchangeable parts, and 3) have a library of interchangeable parts, and a way for making more of them himself. Coby’s design is available on Instructables, here. Our hope with Superhero Cyborgs is to 1) demonstrate to kids that they’re not limited to the (often very expensive) options on the market, 2) to reframe limb loss as an opportunity for something better, and 3) to show kids how to bring their ideas into reality. Designer as end-user can be incredibly powerful and empowering, especially in collaboration with designers and engineers, whose job is to make ideas into reality. We’re looking to offer another Superhero Cyborgs again this summer – details TBD. If you’d be interested in helping to facilitate, would like to enroll yourself or someone else, or know of any sponsors who might be interested in making this incredible event happen again, please let us know and we’ll keep you in the loop!